Maruti Suzuki has added yet another special edition in its fleet. This time, the MPV, Ertiga has come with limited edition features. Only the mid-level variants, VDi and VXi, are available in this particular trim. The price starts from Rs. 7.85 lakh, ex-showroom, Delhi. The limited edition Ertiga comes with many added features. On the outside, the Ertiga gets a new body colour – Exquisite Maroon. The special edition Ertiga is also offered with the Silky Silver and Superior White body colour. The trim also gets stylish alloy wheels, chrome fog lamp bezel, and chrome bodyside moulding. On the inside, there are many more additions to make the car feel special. 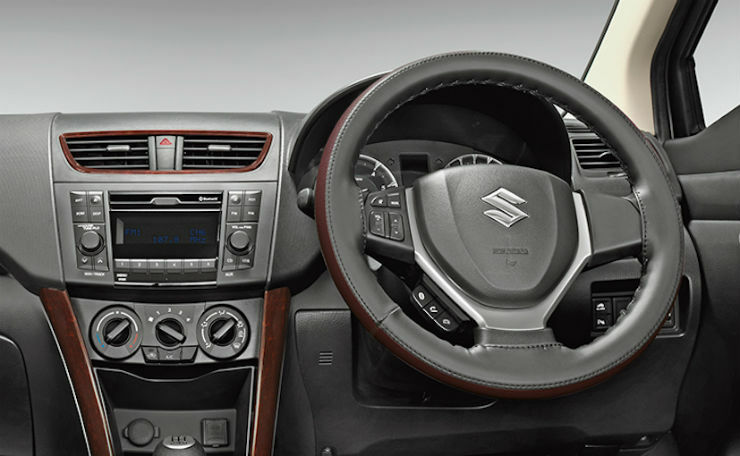 Adding more comfort for the passengers, the Ertiga gets premium seat covers, wooden garnish on the interior styling kit, chrome accent finish on the dashboard, armrest for the front passengers, dual-tone steering cover, white ambient light and cushion pillows. The complete set cost Rs. 16,990 extra. Mechanically, the Ertiga remains unchanged. The vehicle is powered by of 1.4-litre K-Series petrol engine that develops a maximum of 94 BHP or a 1.3-litre diesel engine that generates a maximum of 89 BHP. There is a 5-speed manual gearbox on offer with both the engine options while the petrol engine also gets a choice of 4-speed automatic. Maruti Ertiga was launched in 2012, since then, the car has sold over three lakh units. The Ertiga is second most popular MPV in the country after the Toyota Innova Crysta. « This is the new Mitsubishi Lancer; Should this come to India!